The second over the weekend, the eruption of Agung volcano began at 10:05 am local time on Sunday, December 24. The volcano threw out the grayish dense smoke that the wind blew to the northeast, the Indonesian Disaster Management Agency said. “The eruption lasted 10 minutes. It was clear how white smoke poured from the top of the volcano after the explosion, “- said the spokesman of the agency Sutopo Purvo Nugroho. He added that Agung’s volcanic activity remains intense. The Indonesian authorities assigned the highest level of alarm to the volcano on November 27. Press-secreting indicates that the significant impact over the past two days of eruptions in a row Agung Bali did not have. “In the daytime life in Bali usually goes on, people are calm. Now they have enough knowledge about the impact of the volcanic eruption, “the official added. Earlier Agung volcano exploded on Saturday, December 23, at 11:57 am. Ashtrays in the villages on the slope of the volcano. 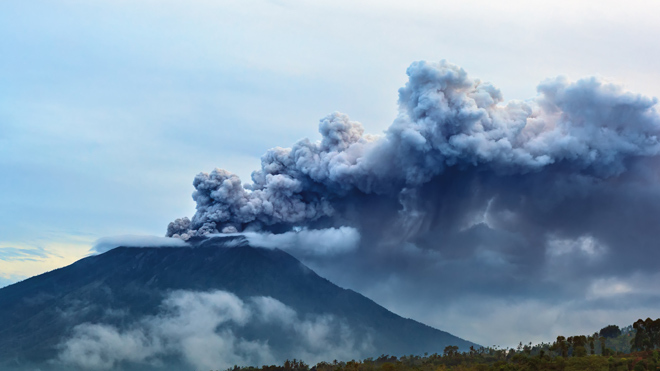 Transport Minister of Indonesia Budi Karja Sumadi said on Saturday that the eruption will not affect the airports of Bali and the neighboring island of Lombok, since the east wind prevailed. The Ministry did not announce an aviation alarm in connection with the last volcanic eruption. Volcano Agung woke up in September after 54 years of sleep. Volcanic activity significantly influenced the tourism industry of Bali.